This week I’ve felt the weight of disappointment tugging like a toddler eager for my attention, standing in my shadow, tugging on the hem of my skirt and loudly demanding a response. As my plans have unraveled, frustration has begun to rub against my heart like a wire brush on metal left to rust in the rain. Here, my spirit aches with the irritation brought on by a rough soul sanding. Here, I attempt to gather my scattered thoughts like the piles of dirty clothes that have accumulated on my laundry room floor, and I marvel at all the wasted moments that have filled my week. Energy given to frustration rather than surrender. Thoughts given to irritation rather than prayer. Words uttered in complaint rather than praise. Time spent wading deep in worry rather than the word. A heart left to rust in the rain rather than taken to the safety of cover. Here, as the washing machine rumbles and laundry beats against the dryer drum, I call out to Christ to redeem all the rusted moments, and in the space carved out between piles of laundry and scattered thoughts, I hear him whisper. I’ve been waiting for you sweet one. Give your moments to me. I am in the business of restoration. I will make things new. I will use it all for your good. 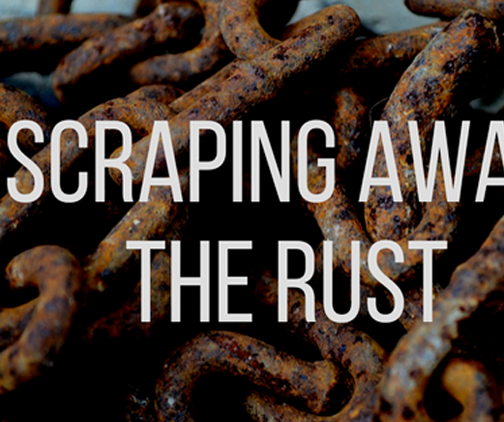 At the end of a week filled with discouragement and frustration, Christ has begun the beautiful, conforming work of scraping away the rust. It is here as he scrapes and sands that I am learning to trust that, with each twist and turn on his windy road to redemption, Christ is bringing me closer to home. Dear friend, I pray that you would hear his whisper today and trust him that his beautiful, conforming work is bringing you one step closer to home.